Singing was a long-standing, communal tradition amongst our ancestors and was one area where they had excelled, even over their white European neighbors. While the tone, range of voice and meter in which they sang were unique and pleasing, there was a fourth element to this Indian hymnody which was just as important; its depth of feeling. Brothertown hymnody centered on Christ and, couched within the edifying bonds of their community, also became a way to express the strong clash of emotions that swirled around their Native American heritage. These strong emotions, coupled with their technical abilities, elicited strong superlative responses from those who heard the Brotherton Indians sing. For a song to be truly beautiful and touch the heart of a listener it must first touch the heart of the singer; it must be rooted in conviction, feeling and emotion. In the preface to his 1774 hymnal, Samson Occom claimed that there were 2 parts to singing: the “outward form” and the “inward part”. He said, “To sing without the spirit, (though with good method) is like the sound of a musical instrument without life.” For Occom and the Christian Indians, singing was first, a way to express their strong belief in and love of God and to worship and praise Him. While they were called and responded to Christ as individuals they also responded to Him as a community. As members of the same Brothertown Tribe they had a long history together. They had suffered, moved, travelled, rebuilt lives and homesteads, and endured many things. Assured of the love of their God and within these familial bonds of community they became free to express the Native American angst that touched them so deeply. Despite the inculcation of the strong and persistent centuries old anti-Indian stance of society, the Brotherton always held a very deep love for their kinsmen and had a great longing to see their Tribe, and all Native Americans, endure and prosper. This is very clear in an 1854 letter of Thomas Commuck to the Wisconsin Historical Society. He wrote a brief “Sketch of the Brothertown Indians” and told of the sorrows and trials of our ancestors and of how he feared the loss of their memory as he contemplated, what seemed to him, the extinction of Brothertown “in another generation” or so. Toward the end of this letter he said, “Here we have taken our last stand, as it were, and are resolved to meet manfully, that overwhelming tide of fate, which seems destined, in a few short years, to sweep the Red Man from the face of existence. The thought is a sad and gloomy one, but the fiat seems to have gone forth, and we must submit (14).” That he loved his Tribe and people is without question. Not only is it apparent in this letter, but also in the tune book he published in 1845 in which nearly every title bears the name of a Native American tribe or individual. The depth of feeling that the Brothertons poured into their music was both a praise of God and an outlet through which they could safely express their personal and Native American hopes, joys, sorrows, fears, and angst. The strength of these feelings both released a beauty into their singing and also became the very thing that caused hymnody to remain a vital and enduring part of the Brothertown community. (14)Commuck, Thomas. “Sketch of the Brothertown Indians.” Wisconsin Historical Collections 4. (15)Miller, Wesson Gage. Thirty Years in the Itinerancy p36-37. Hymn singing was a part of the education that the future Brothertown founders received at Eleazar Wheelock’s Moor’s Indian Charity School. Samson Occom, brothers David Fowler and Jacob Fowler, and Joseph Johnson all attended this school prior to their missionary work and the forming of Brothertown. Not only did our ancestors practice three part singing at Wheelock’s school but they also relied on it to engage and teach their own Native students. Occom, the Fowlers, Johnson, and all of the missionaries who had attended the Charity School in Connecticut had practiced singing and learned new hymns while they were students there. After graduating, they used hymn singing themselves to engage and teach their own Native “scholars”. Singing, for the Brothertown founders however, was not simply a tool of conversion or an enjoyable way to engage their students, it was something that held a much deeper meaning for them and out-endured the missionaries themselves as well as their “scholars”. Courtney Cottrell’s talk on the Brothertown Indians, hosted by the Calumet County Historical Society, has been rescheduled for Monday April 17 at 6pm CT. The event will be held at the Chilton Public Library and is free and open to the public. Please make plans to attend. If you live hundreds or thousands of miles away, don’t despair. The presentation is scheduled to be broadcast in real time via Zoom! Log in details have been posted at the Brothertown Facebook page or you may also contact me here to request login information. Anyone interested in Brothertown is welcome to attend. Native Americans in New England were no strangers to singing. Song and dance had been a part of their culture for at least hundreds, if not thousands, of years. Missionaries to New England used this to their advantage. They taught the Indians about God and Christianity, in part, through the singing of hymns and then documented their astonishing ability to retain these hymns, adapt them to the “Indian meter”, and then sing them back in their own unique manner. There are many more examples that show a long continuity of missionaries engaging Indians in the New England area through something they already enjoyed and which they could relate to and adapt; singing. Moor’s Indian Charity School was yet another place where the Algonquin Indians had a chance to practice this long-standing tradition. (4) Commuck, Thomas. Indian Melodies, p 63. Many thanks to Mr. Gabriel Kastelle for the wonderful presentation he gave this past Sunday evening (April 9, 2017)! 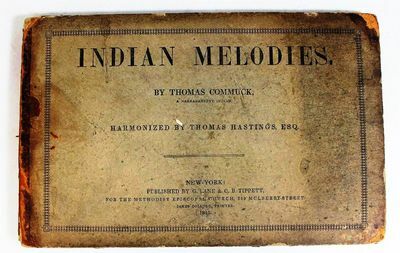 Mr Kastelle spoke to us on the importance and endurance of Brothertown hymnody from Samson Occom’s 1774 hymnal to Thomas Commuck’s 1845 Indian Melodies. Mr. Kastelle has done an impressive amount of independent research on Brothertown, our founders and our ancestral tribal histories. This research, together with his musical degrees and long time involvement in shape note singing make Mr. Kastelle uniquely qualified to recognize, understand, and address the many intricacies involved in the presenting and “re-remembering” of this important part of Brothertown culture. I must also add that Gabriel Kastelle’s enormous respect and deep reverence for our Brothertown founders, history and the travails of our people make his presentation all that much more compelling. Interspersed throughout the talk you will find several examples of Commuck’s tunes played on the violin. You can view the full presentation on Brothertown Forward’s YouTube channel. Saturday, May 20th, is the date for the annual Brothertown Indian Nation elections. Be sure to vote at the BINCC or return your absentee ballot by mail. Word has it that election information will be mailed out to all eligible voters next week. Please remember to call the office with any address updates. While the date has yet to be set, Joanna Brooks, author of The Collected Writings of Samson Occom, Mohegan, has agreed to do a live online presentation for Brothertown Forward!!! Stay tuned for more details. Please feel free to leave comments or contact me for more information on any of the above events.